This article is about public roads. For other uses of highway, see Highway (disambiguation). The Evitamiento Highway, in Lima, Peru. According to Merriam Webster, the use of the term predates 12th century. According to Etymonline, "high" is in the sense of "main". 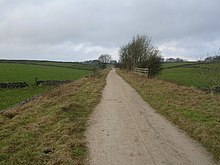 Traditionally highways were used by people on foot or on horses. Later they also accommodated carriages, bicycles and eventually motor cars, facilitated by advancements in road construction. In the 1920s and 1930s, many nations began investing heavily in progressively more modern highway systems to spur commerce and bolster national defense. 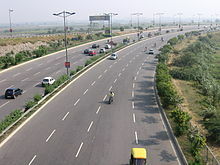 Major modern highways that connect cities in populous developed and developing countries usually incorporate features intended to enhance the road's capacity, efficiency, and safety to various degrees. Such features include a reduction in the number of locations for user access, the use of dual carriageways with two or more lanes on each carriageway, and grade-separated junctions with other roads and modes of transport. These features are typically present on highways built as motorways (freeways). The general legal definition deals with right of use not the form of construction; this is distinct from e.g. the popular use of the word in the US. A highway is defined in English common law by a number of similarly-worded definitions such as "a way over which all members of the public have the right to pass and repass without hindrance" usually accompanied by "at all times"; ownership of the ground is for most purposes irrelevant thus the term encompasses all such ways from the widest trunk roads in public ownership to the narrowest footpath providing unlimited pedestrian access over private land. A highway might be open to all forms of lawful land traffic (i.e. vehicular, horse, pedestrian) or limited to specific types of traffic or combinations of types of traffic; usually a highway available to vehicles is available to foot or horse traffic, a highway available to horse traffic is available to pedestrians but exceptions can apply usually in the form of a highway only being available to vehicles or subdivided into dedicated parallel sections for different users. A highway can share ground with a private right of way for which full use is not available to the general public as often will be the case with farm roads which the owner may use for any purpose but for which the general public only has a right of use on foot or horseback. The status of highway on most older roads has been gained by established public use while newer roads are typically dedicated as highways from the time they are adopted (taken into the care and control of a council or other public authority). In England and Wales, a public highway is also known as "The Queen's Highway". The core definition of a highway is modified in various legislation for a number of purposes but only for the specific matters dealt with in each such piece of legislation. This is typically in the case of bridges, tunnels and other structures whose ownership, mode of use or availability would otherwise exclude them from the general definition of a highway, examples in recent years are commonly toll bridges and tunnels which have the definition of highway imposed upon them (in a legal order applying only to the individual structure) to allow application of most traffic laws to those using them but without causing all of the general obligations or rights of use otherwise applicable to a highway. "any way (other than a waterway) over which there is a public right of passage (by whatever means [and whether subject to a toll or not]) and includes the road’s verge, and any bridge (whether permanent or temporary) over which, or tunnel through which, the road passes; and any reference to a road includes a part thereof; "
The word highway is itself no longer a statutory expression in Scots law but remains in common law. California Vehicle Code, Sections 360, 590, define a "highway" as only a way open for use of motor vehicles, but the California Supreme Court has held that "the definition of 'highway' in the Vehicle Code is used for special purposes of that act," and that canals of the Los Angeles neighborhood of Venice, California, are "highways" that are entitled to be maintained with state highway funds. Smaller roads may be termed byways. A German Autobahn in the 1930s. Modern highway systems developed in the 20th century as the automobile gained popularity. The world's first limited access road was constructed on Long Island New York in the United States known as the Long Island Motor Parkway or the Vanderbilt Motor Parkway. It was completed in 1911. In Italy the Milano-Varese 49 km (30 mi) long autostrada was opened in 1924. 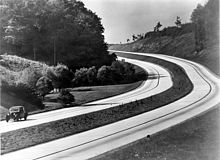 Construction of the Bonn–Cologne autobahn began in 1929 and it was opened in 1932 by the mayor of Cologne, Konrad Adenauer. In the USA, the Federal Aid Highway Act of 1921 (Phipps Act) enacted a fund to create an extensive highway system. In 1922, the first blueprint for a national highway system (the Pershing Map) was published. The Federal Aid Highway Act of 1956 allocated $25 billion for the construction of the 41,000-mile-long (66,000 km) Interstate Highway System over a 20-year period. In Great Britain, the Special Roads Act 1949 provided the legislative basis for roads for restricted classes of vehicles and non-standard or no speed limits applied (later mostly termed motorways but now with speed limits not exceeding 70 mph); in terms of general road law this legislation overturned the usual principle that a road available to vehicular traffic was also available to horse or pedestrian traffic as is usually the only practical change when non-motorways are reclassified as special roads. The first section of motorway in the UK opened in 1958 (part of the M6 motorway) and then in 1959 the first section of the M1 motorway. Commonwealth Avenue, a major intercity highway in northeastern Manila metropolitan area, the Philippines. Reducing travel times relative to city or town streets, modern highways with limited access and grade separation create increased opportunities for people to travel for business, trade or pleasure and also provide trade routes for goods. 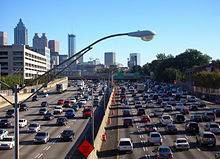 Modern highways reduce commute and other travel time but additional road capacity can also release latent traffic demand. If not accurately predicted at the planning stage, this extra traffic may lead to the new road becoming congested sooner than would otherwise be anticipated by considering increases in vehicle ownership. More roads allow drivers to use their cars when otherwise alternatives may have been sought, or the journey may not have been made, which can mean that a new road brings only short-term mitigation of traffic congestion. Where highways are created through existing communities, there can be reduced community cohesion and more difficult local access. Consequently, property values have decreased in many cutoff neighborhoods, leading to decreased housing quality over time. In transport, demand can be measured in numbers of journeys made or in total distance travelled across all journeys (e.g. passenger-kilometres for public transport or vehicle-kilometres of travel (VKT) for private transport). Supply is considered to be a measure of capacity. The price of the good (travel) is measured using the generalised cost of travel, which includes both money and time expenditure. The effect of increases in supply (capacity) are of particular interest in transport economics (see induced demand), as the potential environmental consequences are significant (see externalities below). In addition to providing benefits to their users, transport networks impose both positive and negative externalities on non-users. The consideration of these externalities—particularly the negative ones—is a part of transport economics. Positive externalities of transport networks may include the ability to provide emergency services, increases in land value and agglomeration benefits. Negative externalities are wide-ranging and may include local air pollution, noise pollution, light pollution, safety hazards, community severance and congestion. The contribution of transport systems to potentially hazardous climate change is a significant negative externality which is difficult to evaluate quantitatively, making it difficult (but not impossible) to include in transport economics-based research and analysis. Congestion is considered a negative externality by economists. A 2016 study finds that for the United States "a 10% increase in a region's stock of highways causes a 1.7% increase in regional patenting over a five-year period." Noise, light and air pollution are negative environmental effects highways can have on their surroundings. Highways are extended linear sources of pollution. Roadway noise increases with operating speed so major highways generate more noise than arterial streets. Therefore, considerable noise health effects are expected from highway systems. Noise mitigation strategies exist to reduce sound levels at nearby sensitive receptors. The idea that highway design could be influenced by acoustical engineering considerations first arose about 1973. Air quality issues: Highways may contribute fewer emissions than arterials carrying the same vehicle volumes. This is because high, constant-speed operation creates an emissions reduction compared to vehicular flows with stops and starts. However, concentrations of air pollutants near highways may be higher due to increased traffic volumes. Therefore, the risk of exposure to elevated levels of air pollutants from a highway may be considerable, and further magnified when highways have traffic congestion. New highways can also cause habitat fragmentation, encourage urban sprawl and allow human intrusion into previously untouched areas, as well as (counterintuitively) increasing congestion, by increasing the number of intersections. They can also reduce the use of public transport, indirectly leading to greater pollution. High-occupancy vehicle lanes are being added to some newer/reconstructed highways in North America and other countries around the world to encourage carpooling and mass-transit. These lanes help reduce the number of cars on the highway and thus reduces pollution and traffic congestion by promoting the use of carpooling in order to be able to use these lanes. However, they tend to require dedicated lanes on a highway, which makes them difficult to construct in dense urban areas where they are the most effective. To address habitat fragmentation, wildlife crossings have become increasingly popular in many countries. Wildlife crossings allow animals to safely cross human-made barriers like highways. Road traffic safety describes the safety performance of roads and streets, and methods used to reduce the harm (deaths, injuries, and property damage) on the highway system from traffic collisions. It includes the design, construction and regulation of the roads, the vehicles used on them and the training of drivers and other road-users. A report published by the World Health Organization in 2004 estimated that some 1.2m people were killed and 50m injured on the roads around the world each year and was the leading cause of death among children 10–19 years of age. The report also noted that the problem was most severe in developing countries and that simple prevention measures could halve the number of deaths. For reasons of clear data collection, only harm involving a road vehicle is included. A person tripping with fatal consequences or dying for some unrelated reason on a public road is not included in the relevant statistics. International sign used widely in Europe denoting the start of special restrictions for a section of highway classed as a motorway. Russian Federal M8 highway sign. The Cross Bronx Expressway in New York, United States uses asphalt and concrete pavement, both of which are popular road surfaces on highways. The United States has the world's largest network of highways, including both the Interstate Highway System and the U.S. Highway System. At least one of these networks is present in every state and they interconnect most major cities. China's highway network is the second most extensive in the world, with a total length of about 3,573,000 kilometres (2,220,000 mi). China's expressway network is the longest Expressway system in the world, and it is quickly expanding, stretching some 85,000 kilometres (53,000 mi) at the end of 2011. In 2008 alone, 6,433 kilometres (3,997 mi) expressways were added to the network. 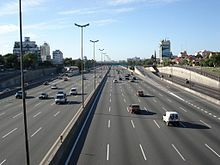 The Pan-American Highway, which connects many countries in the Americas, is nearly 25,000 kilometres (15,500 mi) long as of 2005[update]. The Pan-American Highway is discontinuous because there is a significant gap in it in southeastern Panama, where the rainfall is immense and the terrain is entirely unsuitable for highway construction. The Trans-Canada Highway has one main route, a northern route through the western provinces, and several branches in the central and eastern provinces. The main route is 7,821 km (4,860 mi) long as of 2006[update] alone, and the entire system is over 10,700 km long. The TCH runs east-west across southern Canada, the populated portion of the country, and it connects many of the major urban centres along its route crossing all provinces, and reaching nearly all of their capital cities. The TCH begins on the east coast in Newfoundland, traverses that island, and crosses to the mainland by ferry. It crosses the Maritime Provinces of eastern Canada with a branch route serving the province of Prince Edward Island via a ferry and bridge. After crossing the remainder of the country's mainland, the highway reaches Vancouver, British Columbia on the Pacific coast, where a ferry continues it to Vancouver Island and the provincial capital of Victoria. Numeric designation is the responsibility of the provinces, and there is no single route number across the country. Australia's Highway 1 at over 14,500 km (9,000 mi). It runs almost the entire way around the continent's coastline. With the exception of the Federal Capital of Canberra, which is far inland, Highway 1 links all of Australia's capital cities, although Brisbane and Darwin are not directly connected, but rather are bypassed short distances away. Also, there is a ferry connection to the island state of Tasmania, and then a stretch of Highway 1 that links the major towns and cities of Tasmania, including Launceston and Hobart (this state’s capital city). The United States of America has approximately 6.43 million kilometres (4,000,000 mi) of highway within its borders as of 2008[update]. Highway 401 in Ontario, Canada, has volumes surpassing an average of 500,000 vehicles per day in some sections of Toronto as of 2006[update]. The Katy Freeway (part of Interstate 10) in Houston, Texas, has a total of 26 lanes in some sections as of 2007[update]. However, they are divided up into general use/ frontage roads/ HOV lanes, restricting the traverse traffic flow. Interstate 5 along a two-mile-long (3.2 km) section between Interstate 805 and California State Route 56 in San Diego, California, which was completed in April 2007, is 22 lanes wide. The Karakoram Highway, between Pakistan and China, is at an altitude of 4,693 metres (15,397 ft). Highway bus lane on Gyeongbu Expressway in South Korea. Some countries incorporate bus lanes onto highways. In South Korea, in February 1995 a bus lane (essentially an HOV-9) was established between the northern terminus and Sintanjin for important holidays and on 1 July 2008 bus lane enforcement between Seoul and Osan (Sintanjin on weekends) became daily between 6 a.m. and 10 p.m. On 1 October this was adjusted to 7 a.m. to 9 p.m. weekdays, and 9 a.m. to 9 p.m. weekends. In Hong Kong, some highways are set up with bus lanes to solve the traffic congestion. Traffic congestion was a principal problem in major roads and highways in the Philippines, especially in Metro Manila and other major cities. The government decided to set up some bus lanes in Metro Manila like in the Epifanio delos Santos Avenue. ^ "Queen's highway". Oxford Dictionaries. Oxford University Press. 2013. ^ Faulds, Ann; Craggs, Trudi & Saunders, John (31 January 2008). Chapter 4: The Definition of a Road?. Scottish Roads Law (2nd ed.). Practical Law Company. Retrieved 21 March 2014. ^ "23 U.S. Code § 101". ^ "City of Long Beach v. Payne". Justia Law. Retrieved 14 February 2017. ^ "highways and byways". The free dictionary. Retrieved 21 April 2010. ^ "An Autobahn Timeline". About.com. Retrieved 10 April 2010. ^ "German Myth 8 Hitler and the Autobahn". About.com. ^ "History of the Interstate Highway System". Federal Highway Administration. Retrieved 10 April 2010. ^ "Special Roads Act 1949" (PDF). Office of Public Sector Information. ^ "M1 London: Yorkshire Motorway, M10 and M45". Motorway Archives. Archived from the original on 16 April 2010. Retrieved 10 April 2010. ^ Small, Kenneth A. & Gomez-Ibañez, José A. (1998). Road Pricing for Congestion Management: The Transition from Theory to Policy. The University of California Transportation Center, University of California at Berkeley. p. 213. ^ Agrawal, Ajay; Galasso, Alberto; Oettl, Alexander (2017). "Roads and Innovation". The Review of Economics and Statistics. 99 (3): 417–434. doi:10.1162/REST_a_00619. ^ Shadely, John (1973). Acoustical analysis of the New Jersey Turnpike widening project between Raritan and East Brunswick. Bolt Beranek and Newman. ^ Hogan, Michael (17–18 April 1973). Highway Noise. 3rd Environmental Pollution Symposium, sponsored by AIAA, ACS, ASME, SAE. Menlo Park, CA: SRI International. ^ Zimmerman, Jess. "These beautiful bridges are just for animals". ^ "World report on road traffic injury prevention". World Health Organisation. Retrieved 14 April 2010. ^ "UN raises child accidents alarm". BBC News. 10 December 2008. ^ "National Motor Vehicle Crash Causation Survey" (PDF). U.S. Department of Transportation. Retrieved 7 August 2014. ^ Graham-Harrison, Emma (16 November 2007). "China says needs extra million km of roads by 2020". Reuters. ^ "15-3 Length of Transport Routes at Year-end by Region". China National Bureau of Statististcs. 2007. Retrieved 12 January 2013. ^ "China Has 3.48 Mln Km of Highways in Operation". Chinagate.cn. 6 March 2007. Retrieved 12 January 2013. ^ "National highway target set for year". Chinadaily.com.cn. 7 January 2008. Retrieved 12 January 2013. ^ "China Road Construction Report, 2007–2008". Okokok.com.cn. 22 December 2008. Retrieved 12 January 2013. ^ Staff (10 February 2011). "China Expressway System to Exceed US Interstates". New Geography. Retrieved 21 March 2014. ^ "中国高速公路总里程达8.5万公里 今年新增1.1万 – 沈阳广播电视台官方网站 – 沈阳电视台 – 资讯潮流 趣味生活 尽在沈视网！". Csytv.com. Archived from the original on 2 February 2013. Retrieved 12 January 2013. ^ Xin Dingding (16 January 2009). "More rural roads planned this year". China Daily. Retrieved 12 January 2013. ^ "Trans-Canada Highway: Bridging the Distance". CBC Digital Archives. Retrieved 20 December 2006. ^ Central Intelligence Agency. "Transportation: Roadways". CIA World Factbook. ^ Ministry of Transportation (Ontario) (6 August 2002). "Ontario government investing $401 million to upgrade Highway 401". Archived from the original on 14 September 2007. Retrieved 20 December 2006. 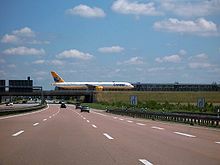 ^ "List of World record highways". Inautonews.com. Archived from the original on 11 November 2013. Retrieved 21 March 2014. ^ Schmidt, Steve (28 March 2007). "Four new southbound lanes at I-5/805 merge set to open". San Diego Union-Tribune. Archived from the original on 18 July 2011. ^ Notable for the introduction of the world's first electronic toll collection system, the Via Verde. Look up highway in Wiktionary, the free dictionary. This page was last edited on 16 April 2019, at 19:08 (UTC).